If you look closely at the interior of the 2015 Dodge Charger, you’ll notice not just that the materials are improved and the ergonomics are spot-on, but things like an imprint on the change tray of the center console that says “Dodge Brothers, Designed in Detroit.” It’s this fine attention to detail that sets apart the latest incarnation of the Dodge Charger- from fine-tuned exterior upgrades, to refined interiors, and tweaks under the hood that contribute to improved performance and drive. At Melloy Dodge, we’re thrilled to get our hands on the 2015 model of the Charger, and to get some lucky inhabitants of Albuquerque behind the wheel of this legendary sports car. Before you stop in to our showroom on Coors Blvd. NW for a test drive, let’s get you acquainted with some of the upgrades on the 2015 model. Under the hood, the newest Charger is just as powerful as ever. The whole model range in recent years has been equipped with an ultra-competitive eight-speed TorqueFlite transmission standard, but 2015’s model enjoys as much as 395 lb-ft of torque, made possible through refinements in the car’s internal software. This allows drivers to cruise around New Mexico with immense power and performance, but with improved control and fuel economy. Fuel economy is perhaps one of the most notable enhancements for the 2015 model. The clutch disconnects so all-wheel drive isn’t always engaged, and electric power-assisted steering all contribute to an impressive 31 mpg capability. Check out the exterior of the 2015 Charger at Melloy Dodge’s showroom and you’ll notice that, while maintaining the character of the original models, this Charger is fully modern. Softly scalloped side doors make your sports car stand out, while LED headlights and wide racetrack tail lights make sure you’re seen for miles. Customization is easy on this year’s Charger, but without any bells and whistles, the 2015 Charger will stand out for its beauty. The designers made sure that the car looks longer, lower, and wider, all with less overall weight. Though the 2015 Charger is a real looker on the outside, as the driver, you’ll spend most of your time on the interior. Upgrades have been made to this year’s Charger’s technology to make sure it is ahead of the market. Dual analog gauges and a seven inch LCD display light up the dashboard and are fully customizable with navigation info, tire pressure, performance details, and more. Of course, Dodge’s unique UConnect has been upgraded, and programs such as Pandora are easily accessible. Chargers have always had an undeniable character that has marked them as fast as well as refined. This year, Dodge has made the good even better. Stop in at Melloy Dodge on Coors Blvd. NW today and take a test drive of the latest model, but be prepared to fall in love! 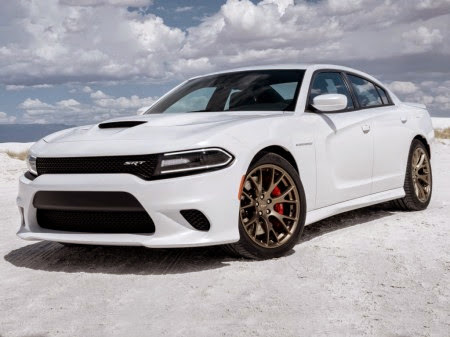 Have more questions about the Charger or the supercharged Charger SRT Hellcat? We love to talk cars! Give us a call at (888) 760-4136.